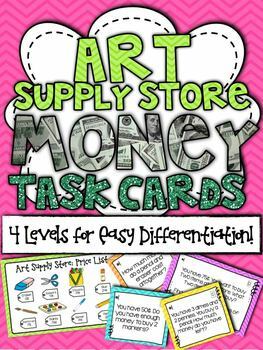 Money Word Problem Task Cards: Art Supply Store! 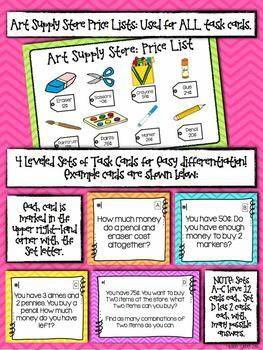 Kids will love developing their problem solving skills with these fun task cards! 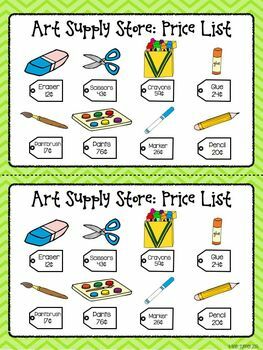 The cards are anchored around an art supply store price list and aligned with Common Core money and problem-solving standards for 2nd and 3rd grades. 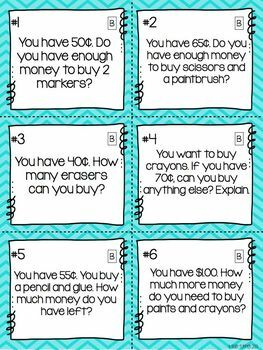 Give each student their own copy of the price list to use to solve each task card. -Give each student a price list page. This page is used for all task cards, regardless of level. -Have students answer and show their work for each task card on the recording sheet. -The leveled card sets can be used to give each student differentiated practice during the same lesson. -Alternately, you can use a single set of task cards during a single lesson, or as a center, and move through the different levels over the course of your unit. Make sure to check out the preview file for example task cards from each leveled set!